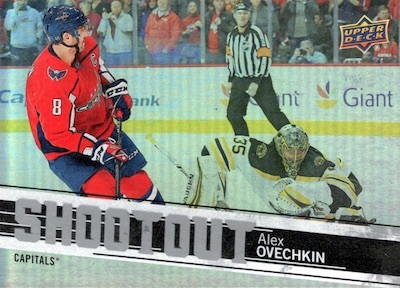 An annual promo in the hockey card world, 2018-19 Upper Deck Overtime Hockey offers an incentive for collectors to order specific '18-19 NHL Hobby boxes. The packs are exclusive to GTS Distribution in the United States and Universal Distribution in Canada. Those familiar with prior OT sets will know what to expect this year. The set is released in three different waves, with the first wave containing 60 cards, including 40 base cards, five Legends (#41-45) and another 15 subjects in the Rookies subset (#46-60). 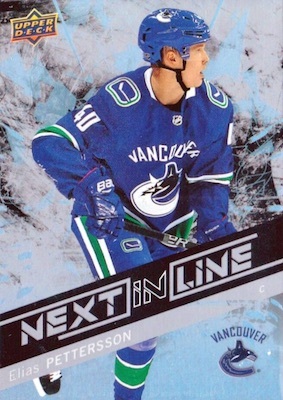 Parallels include limited Blue Foil editions for the base (1:3 packs), Legends (1:40 packs) and Rookies (1:14 packs). In addition, the entire set has Red Foil parallels numbered to 99 copies. 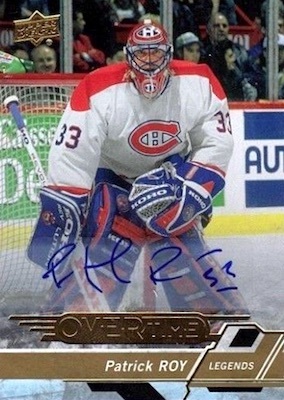 The rare Gold Foil Autograph cards add a signature for select players. 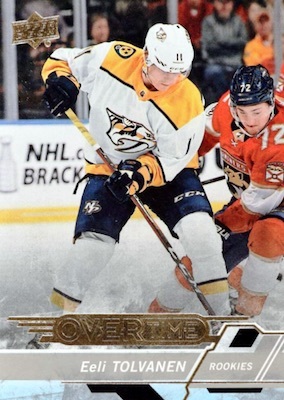 Each wave in the 2018-19 Upper Deck Overtime Hockey checklist has an exclusive insert, as well. For Wave 1, that's the one-per-pack Shootout, which works in Red (#/25), Blue (#/10) base parallels, and Gold Autograph (#/3) parallels. There are also Instant Win Redemption cards good for free UD Hockey boxes. In order to claim a free pack with your box, the card shop must buy from either GTS or Universal Distribution. 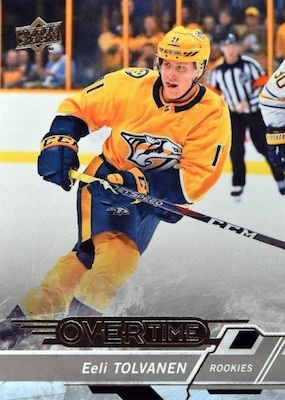 It is strongly advised to confirm the 2018-19 Upper Deck Overtime Hockey promo is available before placing your order. Awarding one free pack per box, the promotion applies to various UD releases throughout the year. 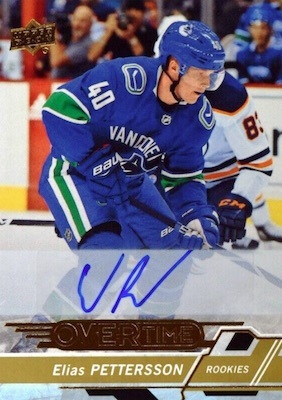 Super Rare 2018-19 UD Overtime Eeli Tolvanen Next In Line Auto Gold #3 3 SSP! 180 cards, with 60 each in Wave 1, Wave 2 and Wave 3. Buy on eBay. FOIL PARALLELS: Blue*, Red #/99. *Wave 1 Blue Foil odds: Base - 1:2.5 packs; Legends - 1:40 packs; RC - 1:13.3 packs*. *Wave 2/Wave 3 Blue Foil odds: Base - 1:2.5 packs; RC - 1:10 packs*. Unannounced. Let us know if you spot any others. 57 cards in W1. 53 cards in W2. 57 cards in W3. Buy on eBay. W1 odds - 1:36 packs. W2/W3 odds: Base - 1:90 packs, RC - 1:60 packs. 20 cards. 1 per Wave 3 pack. RAINBOW PARALLELS: Red #/25, Blue #/10. 18 cards. Serial numbered #/3. 20 cards. 1 per Wave 2 pack. 17 cards. Serial numbered #/3. 20 cards. 1 per Wave 1 pack. Thanks for posting the Odds Trey..
any chance that you can go to the same guy at UD who provided the Odds for this year – to get Odds for last couple of years..
if they cant provide odds then logic says they should be able to provide print runs for some of the big guys like Laine, Matthews in 2016-17 or Boeser.. last year ..
since those players can go for good money – its only fair since you have this website that UD should provide more info for those. I do what I can. That is what we have. Hey Trey, is there any sign of the Wave Two Checklist? Been seeing the cards on eBay, just no sign of a checklist anywhere. Overall a difficult set to complete so I like the challenge and exclusivity of having a master set of these! so I asked someone who would know.. or be able to REALLY find out..
what was the print run on the variant base.. I really wish that UD would smarten up and do like Panini does with Contender SPs and release the numbers .. at some point .. its cheap and easy hype for the product. Those who know.. know more than the rest.